In order to join the Reading is Fundamental program at the Brooklyn Public Library, I was told that I needed to sign up Greyson for a library card. I needed to? I'd be happy to! But, I didn't even know babies could get their own cards until they told me. Cool! 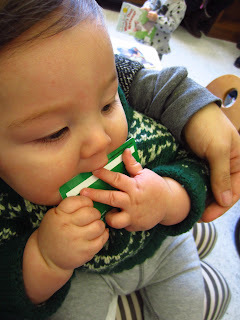 Why get a library card for a baby who can't read or check out his own books? After the jump! Of course it doesn't matter if Greyson has his own library card. It doesn't matter if he has his own savings account either. It doesn't matter if he goes to an art class because he's so young and doesn't get it. Ultimately, you can say none of it matters because he's a baby. But, I really like the idea of instilling good values at an early age. I like the idea of Greyson being able to say when he's older that he's had his own library card since he was six months old. I like the idea of him knowing it was important to us for him to value reading. This is an awesome initiative. Yay to you and to the library! Yes, and if he has any overdue books, he can pay the 15 cents per day late fee! Beijos querida!! !